Music Should Last a Lifetime! 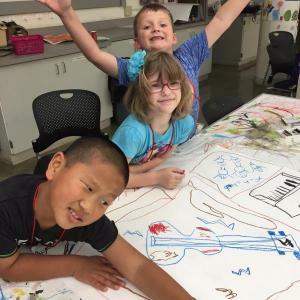 The UNI Community Music School (CMS) offers year-round opportunities to study music for Cedar Valley students of all ages and abilities. CMS first began offering private music lessons in the spring of 2006 with two teachers on staff and 30 students. The first of the CMS recital weekends was hosted that spring – followed by a reception to celebrate with cookies and punch! To establish community-based partnerships to promote and utilize the many resources and facets of cultural diversity at UNI and in the Cedar Valley. CMS continues to grow, by offering more music lessons to area students, and providing teaching opportunities for UNI School of Music students. In 2011, CMS earned the honor of being accredited by the National Association of Schools of Music (NASM). Today, CMS has over 20 teachers on staff and offer lessons and a variety of music programs for hundreds of Cedar Valley children and adults. Private lessons are available on a variety of woodwind, brass, keyboard and percussion instruments, as well as, group piano lessons, the UNI Children’s Choir, the UNI New Horizons Band, and Camp Musicmania. The CMS staff includes professional music educators, performers and UNI School of Music students. Classes and lessons are offered year-round for students of all ages and abilities. 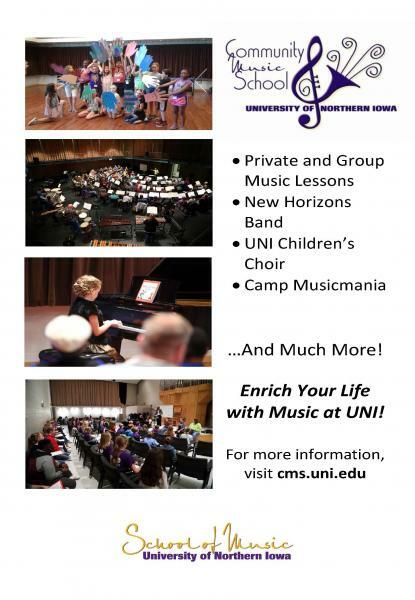 All CMS events are held on the UNI campus in the UNI School of Music facilities and other appropriate area community sites in Cedar Falls and Waterloo, IA.